Interestingly, two of M19’s planeswalkers are strongly tied to specific tribes. While this constrains their deckbuilding options compared to, say, Vivien or Domri Rade, it can also be an advantage when they help you reach a critical mass of synergy. Liliana is less of an early-game explosive card like Sarkhan, and more of a mid-game solidifying or tide-turning card. Certainly her -3 ability works best when you have a lot of mana available and/or a lot of creatures already died from combat and Wrath of God effects. Note that if you go all the way back to Lorwyn, it lets you wipe out a whole bunch of creatures with Nameless Inversion, much like Haakon, Stromgald Scourge used to! Apart from that, her -2 is pretty good at breaking through jammed tables, and is probably best used offensively when possible: it can’t really be used to defend her when you don’t have any creatures in play, and can’t consistently take down the largest creatures without either an excessive amount of setup or the help of other cards. And her +1 has near-perfect synergy with her ultimate, and in an ideal world you’ll be able to chain a few +1s into a -3 and destroy your opponent one way or another in just one turn. It’s been a while since we’ve had planeswalkers who mechanically are tied to specific tribes, particularly in the way this newest Liliana is. 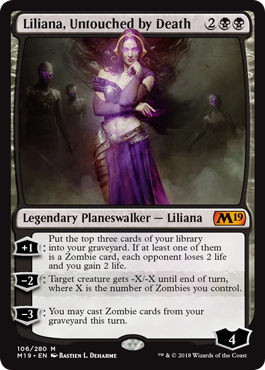 She is a Zombie planeswalker through and through: excellent with that particular class of undead monstrosities, not so hot without them. In fact, all three of her abilities care about the Zombie typeline. Her +1 sets up for her ult: load up the graveyard, with a bit of bleed if you mill a Zombie. Her -2 is removal based on your undead army, and her ult is basically a very, very limited version of Yawgmoth’s Will. Make no mistake, it’s an ability that can end the game on the spot if you set up for it; being able to cast any number of Zombies for the rest of that turn can set up for degenerate combos and chains of play. That said, it needs a fair amount of set-up to work, and you probably do not want to ult her on the turn you cast her (more mana = more Zombies). She’s a very narrow Planeswalker, and she’s also not good in Limited, thanks to the dearth of Zombies in Magic 2019. That said, to the one specific deck she’s designed for, she offers a suite of powerful abilities that will allow you to snowball the game, and so she will likely have a home in that regard!